With this iExpression you can place 3D layers in a circle. Variants like ellipses, spirals or arcs of circles are also possible. This iExpression works exactly as the 2D variant but offers the additional parameter z Offset for the first and last layer to create spirals that are stretched in z direction. In order to orient the layers to look at the middle of the circle, apply the "Look At Line 3D" iExpression to their orientation and choose as first point of the line the center of the sphere and as second point an arbitrary point exactly behind or before it (e.g. the center with a value of 100 added to its z value). If you want the layers to rotate along the circle but do not look at the middle, apply the "Look At Point 2D" iExpression instead to the z rotation and use as "Look At" point (the x and y value of) the center. If you want to move or rotate the circle, its best to set the center to (0,0,0), then create a new NULL object, make it 3D and parent the layers on the circle surface to this NULL. During the parenting keep the alt or option key pressed. Then the position of the NULL becomes the center of the cylinder and you can move or rotate it using the transform controls of the NULL. is the name or index of the first layer that should be placed in the circle. this angle gives the direction where (relative to the center) the first layer is placed. 0 degree means above the center (12 o clock), 90 degree to the right of if (3 o clock), 180 degree below it (6 o clock) etc. is the distance that the first layer has to the center. For circles, this value is identical in both dimensions, for ellipsis you can choose different values in x and y direction. is the name or index of the last layer that should be placed in the circle. this angle gives the direction where (relative to the center) the last layer is placed. 0 degree means above the center (12 o clock), 90 degree to the right of if (3 o clock), 180 degree below it (6 o clock) etc. 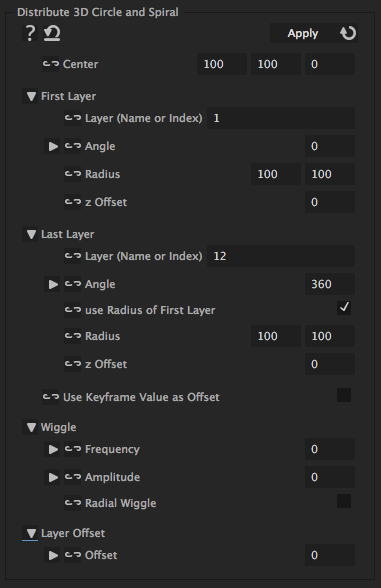 With this option the last layer uses the radius of the first layer (and ignored its own radius). Use this to create circles and ellipses; for spirals the radius of the first and last layer must be different. is the distance that the first layer has to the center. For circles, this value is identical in both dimensions, for ellipsis you can choose different values in x and y direction. For spirals this parameter should differ from the respective parameter for the first layer. adds the keyframed value to the position on the circle. Hence, the layer is only placed exactly on the circle when the keyframed position is (0,0). Other values cause a corresponding offset and allow to animate the position relative to its placement on the circle. makes the layer wiggle around its position in the circle with the given frequency. If you don't want it to move at all, set the frequency to 0.
denotes up to how much the layer may move away from its position on the cirle. To create a little less regular but still not moving circle, set the frequency to 0 and the amplitude to some value greater 0.
makes the layers stay exactly on the circle while they wiggle. In other words, only the angle is wiggled, but not the radius. with an Offset of one, the first layer is removed from the beginning of the arc and added again at the end behind the last layer. For an offset of 2 this happens for the first two layers etc.